It’s time for another item on the DC Omnivore 100 list of the top one hundred foods every good omnivore should try at least once in their lives. Since the launch of this feature back in 2008, there have been a few items on the list that we knew could be controversial – horse, for example, is one of the more obvious ones (and I plan to write about it soon). Foie gras is another, falling in and out of favor depending on whether taste trumps compassion. Some seasons it seems like every restaurant in the city is serving it, others not so much. What’s the deal? Foie gras is the liver of a duck or goose that has been fattened, either force-fed through a traditional French method known as “gavage” or naturally overfed in say, the American method known as “double bacon cheeseburger with fries.” Kidding. It’s an ancient practice going back to the Egyptians and is protected under French law as part of their cultural heritage. 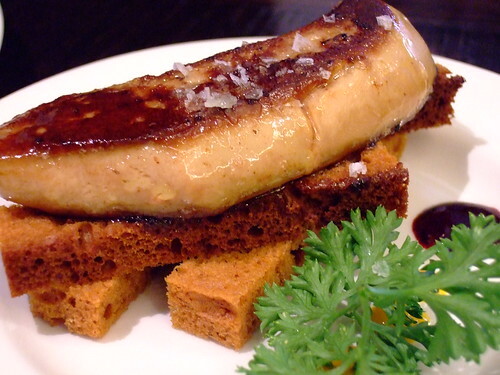 The U.S. is actually the something like the fourth-largest producer of foie gras in the world. Basically the fattening process is exploiting a physiological capacity of migratory birds to store large amounts of food in their expansive throats, to sustain them over long journeys. The birds are fed larger and larger amounts of food until their livers are roughly ten times their ordinary size. With gavage, in the last phase they are force-fed through a pneumatic pump. Grossed out yet? Morally appalled? If you are, you should read about abattoirs and where burgers come from as well. Personally, I’m with Bourdain. There are humane ways for us to get our guilty pleasures. The reason so many people are willing to overlook the process is the result, one of the most luxuriant tastes on earth. Now, foie gras is traditionally considered a luxury and I wouldn’t advocate eating it all the time. It’s a seriously rich dish. For New Year’s Eve last year I had it at Marvin in the most decadent way imaginable to me – topping a wagyu steak. That was ridiculous (and divine) and not something I would recommend more than once a year! But it is possible to have foie gras all over DC these days – back around 2006 to 2008, it fell out of vogue, with cities like Chicago actually banning it for a period. But now it’s even a topping at Ray’s Hell Burger. That is not how I’d recommend it. Why? The richness of foie gras, in my opinion, is something to be savored simply. I also feel that if an animal went through force-feeding for your pleasure, you should respect it with an elegant presentation. But that’s just my sick fancy. What can I say? Milk grosses me out, but I dream of sweetbreads and foie gras, venison and veal cheeks. Because of the high fat content, preparation has to be careful. I’ve never cooked it myself, as I’m terrified it would turn out to be just a puddle of goo on a plate. Quick searing over high heat seems to have best results, the wobbly succulent liver turning into an indescribable pleasure. Serving it cold highlights the dense mouth feel of the fat, almost like chocolate. I’d rather leave it to the experts to prepare. When you have something this decadent on your plate, the accompaniments can often be overlooked, but one of the beauties of foie gras is how well it complements other foods. I especially love it with fruits like fig, apple, and grapes, or sweet flavors like maple, but it can also stand up to peppery greens. And of course, nothing tastes as luscious as salted foie gras on warm toasted bread. I’ve had excellent seared foie gras at Proof and Adour, and delectable cold foie gras terrine at Poste and Bistrot Lepic. Again, it’s not something I’m going to order every time I see it on the menu, and I’m more likely to try it at places that I know have a dedication to quality. There’s nothing worse than being served a skimpy shriveled flap of undercut overcooked foie gras! Argument fail. It’s possible to be grossed out and/or appalled by all those things. And your link to Bourdain’s clip is poor source material. That’s the cleanest bird pen I’ve ever seen. Not to mention the vet is not named except by the woman with the thick French accent. There’s no way to check his background, or potential biases. 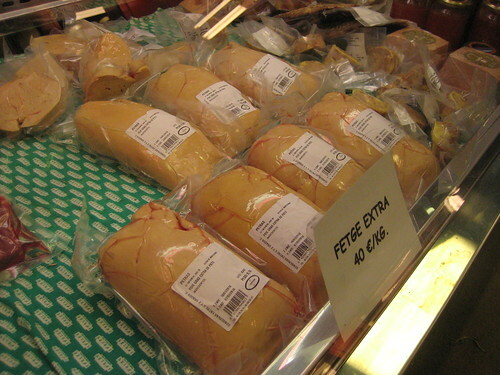 If you like foie gras, it’s a free country and until it’s banned, you’re allowed to eat as much as you want. But some people have equally legitimate objections to them and they do not deserve to be trivialized. I’m not making an argument or writing a dissertation, Apa, I’m stating my opinion. Which you are free to discount as you wish. Of course it’s possible to be grossed out by all those things, I wasn’t saying the opposite. My opinion is that if foie gras methods of production are morally repugnant to you, then you should also be repulsed by modern cattle slaughter methods. Know where your food comes from, know the method, and understand that you can’t be selective in your outrage. I’m not trivializing your objections, I just hope they are consistent. There’s plenty of alternate opinions out there for our readers to sift through- just Google “no foie gras” for example. thanks for reiterating the arguments we vegetarians have been always made. if you really think your fois gras is coming from a “humane” source, i challenge you to go there and see if you still agree that your “guilty pleasure” is worth the trauma inflicted upon animals. Yes. Yes, I still agree that it’s worth it. I’m so glad that we have become the place that vegetarians and vegans go to feel morally superior about their food choices. Tom, have you considered the fact that you may just have regular readers who are vegetarians or vegans, and who feel that as members of the “community” they have just as much right to add their opinion to the discussion as anyone else? Indeed, Nate, and I remind you that the writers are themselves members of the community, entitled to their opinions about how those members of the community choose to express their opinions in the comments on a feature called the Omnivore 100. Just tell me where in DC I can get some elephant foie gras? 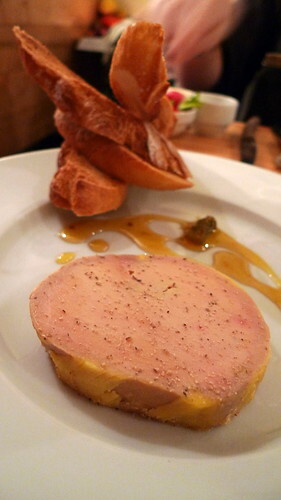 I haven’t had foie gras in years, but this leaves me with the desire to re-live that night! It is tricky–I am not a vegetarian, but I am quite particular about animal products I consume; I try (hoping for honesty in labeling) to purchase products that are free range/grass fed are not fed any animal feed and are free of additives/antibiotics etc. If I am going to consume animal products, I want to make sure that the production is as humane (and healthy) as possible. But, what does one do about things like Foie? It truly is a epicurean delight–and I cannot say that I can (or will) turn it down.